For a smarter, stronger and more contemporary look in your locker room then defintely consider our range of laminate door lockers, Available in a range of colours sizes and locks options, they are very popular in new buildings. 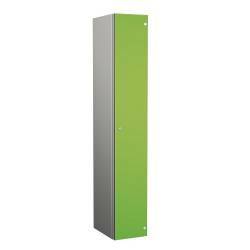 Z lockers are extremely popular right now beacuse they offer the perfect space saving solution for t..
Probe "Z" style locker with 10mm solid grade laminate doors Dimensions: 1780mm H x 380mm W x 460mm D.. Please note this locker is priced on application so please get in touch with our friendly team via t..